"Light, crunchy, round, buttery balls, with chopped nuts in them, coated with confectioner's sugar. These look nice when placed on a tray in the mini paper cupcake liners." Mix all the ingredients together with a mixer until well blended. Roll dough into round small balls. Cool completely then roll in additional confectionary sugar. 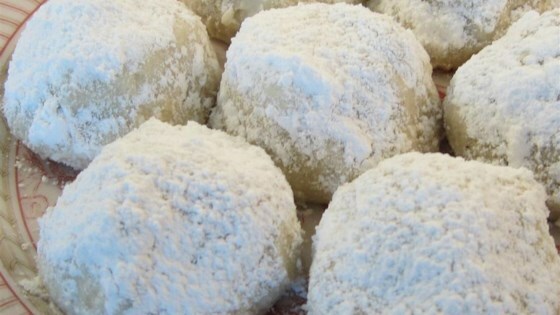 See how to make traditional Russian tea cakes rolled in confectioner's sugar. I made this for my daughters 5th grade class, they were having a mexican party,I wasn't sure if the kids would like them. people are calling me for the recipe.